“IT’S wrong to say the Pet Shop Boys have had a renaissance,” says Neil Tennant. He’s talking about the revival sparked by last album Electric, continuing with new album Super. “It’s not a comeback either. Or a return to form. Or anything like that. “If it is then we are always having renaissances as we’ve never been away,” he adds proudly referring to the duo’s fruitful 35-year career. We’re sat in the boardroom of their record label in South London and the atmosphere is one of excitement as the pair have just been handed vinyl copies of forthcoming album Super. “Whoooo this is amazing,” coos Tennant. “I’m so pleased with it. Can we keep this?” he asks while Lowe happily tells some more news. “We have a pop-up shop. A POP UP SHOP! Can you believe it?” he declares in his northern drawl. “It’s going to be set up here in London and sell signed CDs and T-shirts and lots of things. It’s going to be Super,” he laughs. But then everything is super at the moment for the pair who have sold more than 50million records worldwide since meeting in an electronics shop on the King’s Road in 1981. They are even listed as the most successful duo in UK music history by The Guinness Book of Records and, unlike other bands started in the Eighties, the three-time Brit Award winners have gone the distance without any splits or huge fall-outs. The release of Electric in 2013 saw the Pet Shop Boys return to their dance roots and Super does the same. And whether it’s a renaissance or a revival, Electric gave Tennant, 61, and Lowe, 56, their highest chart position in a long time. It was No3 in the UK — their best since 1993’s Very. “I’m afraid I said in an interview that we are making a trilogy with (producer) Stuart Price. So here we are at number two,” says Tennant. Super was made over the course of a year in London, LA and Berlin. Tennant explains: “We only did eight gigs last year and concentrated on this album. We had 25 songs but all in different styles so we sat down with Stuart and went through them deciding which would work. “We’ve always wanted to do a line-dancing video though”, adds Lowe. Any writer who has interviewed the Pet Shop Boys will know the fun of watching Tennant and Lowe interact. While serious performing their music, when they chat, it’s like a double act. Tennant is the main talker, very serious with his long and drawn-out, slight Geordie accent whereas Lowe talks less but jumps in with a wry remark or a shriek. I say it’s almost autobiographical. “But a decade out,” smiles Tennant. “It’s the early Nineties and based on the story of my friend who came to university in London, met this girl and went clubbing. “All of his fellow students called them The Pop Kids and I made all the rest up. We were going to call it The Club Kids and we have a longer version of it too called The Full Story, which has a Nineties break in the middle and a verse that brings their story up to date. “You could narrate it in your accent,” laughs Tennant. Super is a dance record but both Tennant and Lowe say that, despite the euphoria, there’s darkness to many of the songs. “There is darkness and light in the songs but it gets darker as it goes on.” One song, The Dictator Decides, started off as a satirical poem by Tennant about a leader who wants to pack it all in. “It was a whimsical idea of a dictator like Kim Jong-un of North Korea or Assad in Syria and he’s inherited this job and thinks it’s rubbish because he would really like to go off in his private jet. He’d give it all up and there’d be democracy and everyone would be happier. Twenty-something is a song about being young in London today and comparing it to when Tennant and Lowe moved down from the north. Another song, Inner Sanctum, was inspired after Tennant and Lowe did a show in Las Vegas. Tennant says: “We played this small gig in an electronic dance music club and found ourselves in this inner sanctum. We didn’t know why we were there or anyone in there. “It made me think how the dream of EDM clubbing today is to get into the inner sanctum. You’ve failed if you don’t get there where the supermodels and Kanye and Kim are. 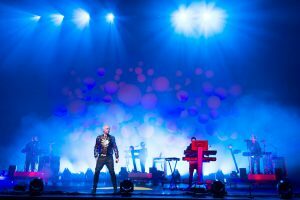 Live shows have become a big part of the Pet Shop Boys experience in recent years. So when writing new songs do the pair think about how it will work at shows? Tennant says: “I do notice that when writing, we do say ‘Oh this will be good live’, which is something we didn’t used to say. “That’s because we never played live at the start,” laughs Lowe. Tennant continues: “For the first few years we didn’t do concerts but when we did a show with (late director) Derek Jarman that was a big thing. We had amazing dancers from LA and we had all these costumes and clips of the seven deadly sins. The extensive world tour that followed Electric was huge and their live high point. Working with award-winning stage designer Es Devlin, how do they plan to develop the Super show? Tennant says: “Well, we are just starting work on our shows at the Royal Opera House in July. “Es has this fantastic energy, as they say in California. She worked with U2 on their tour, which I loved. It was a staggering show. On the subject of Adele, both Tennant and Lowe say there’s no doubting her vocal talents. The Pet Shop Boys are proud of the many artists they’ve worked with including Dusty Springfield, Lady Gaga, Liza Minnelli and Tina Turner. One special moment for the duo was working with the late David Bowie on the song Hallo Spaceboy from his 1995 album Outside. “He was a lot of fun to work with,” says Lowe. Tennant adds: “There’s a picture of Chris and I and David and we are all laughing on it. So having worked with Bowie, is there anyone else they regret never getting to work with? Tennant adds: “And we were going to work on a track she’d made but it never happened and we never met her. In fact I never saw her live though Chris did. “There is a film coming out about her and I can’t wait to see it because she is fascinating. So that is someone we always wished we’d worked with.